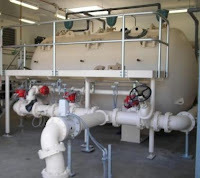 The Spanaway Water District, located near Tacoma, Washington, needed a solution to manganese problems at a 900 GPM well, and a filter design that would fit into their new treatment building layout. They also wanted to minimize the backwash waste set up for discharge into a small infiltration basin. The District had previous failures of off-the-shelf standardized skidmounted vertical pressure filter systems, so they contacted Tonka, looking for a fresh, more robust approach. Tonka’s solution was a horizontal, isolated cell, ASME filter using the new Tonka IMAX media. IMAX is a manganese mineral-based catalytic filter media, capable of filtering up to 12 GPM/sq. ft. This unique media backwashes at very low, conventional rates—much different than other high rate medias, having been developed for use with Tonka’s Simul-Wash™ sustained simultaneous air and water backwash process. The Simul-Wash™ process uses a subfluidized rate of backwash water, combined with air, to create a collapse pulse action in the filter bed, thoroughly scouring the media while saving water. This assures a proper backwash and prevents media growth and dead spots associated with other high-rate media filter designs. Water savings are another major advantage— the Spanaway filter design uses only 150 GPM to backwash each filter cell. During a 15-minute backwash cycle, this equates to tremendous savings of over 80% compared to other medias. Simul-Wash™ also allows the treatment plant to produce 750 GPM of finished water when the Tonka filter is in backwash. The isolated cell design of the horizontal pressure filter allows two cells to remain online and producing water, while the third cell is in backwash. This provides redundancy similar to vertical pressure filters, without the wasted space. The ASME Code stamped isolated cell design also gives the District peace of mind, allowing the filter to remain in service during inspection or maintenance. The combination of Tonka IMAX and isolated cell design results in an excellent facility for the Spanaway Water District and exceptional water quality for its residents.